Are Free Range or Cage Free Eggs ANY DIFFERENT? ~ Companies in the business of selling eggs use terms like “free range” and “cage free” to make people feel better about buying eggs. But most of these hens endure lives just as bleak. ~ Chicks from “free range or cage free” farms are typically purchased from the same hatcheries where male chicks are killed in horrific ways. 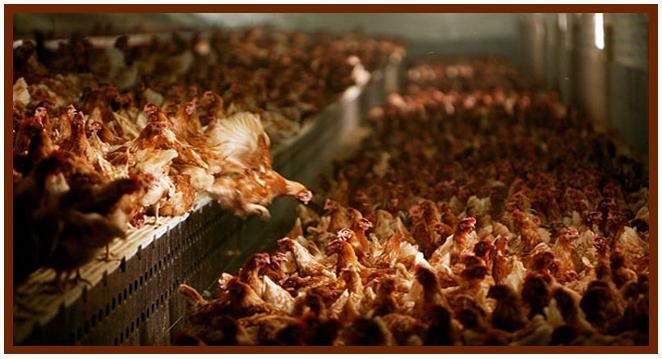 ~ Most hens are subjected to beak mutilation due to crowded conditions and periodic starvation. 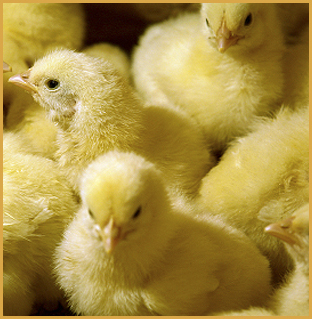 ~ Young hens are killed when they are two years old for low grade meat, as it is not “cost effective” to keep them alive. ~ Hens are typically deprived of basic needs and then brutally killed whether the industry labels it “free range” and “cage free” or not. ~ Birds are not legally protected and suffer abuses that are crimes if inflicted upon a cat or dog. ~ We all have an obligation to prevent cruelty, suffering and unjust killing . ~ There is no dietary need for eggs. In fact, eggs are high in fat and cholesterol. ~ Doctors and scientists have traced diseases like swine flu and avian bird flu to large farms where animals are severely confined. ~ You can still have your cake and eat it too! Delicious desserts can be made without eggs. ~ Eggs are often used in baked products because they bind things together. But there are many ways to do that! Vinegar and baking soda: For a rising or lightening effect in cakes, cupcakes and breads, combine 1 teaspoon of baking soda with 1 tablespoon of vinegar. Ground Flaxseed: Rich in essential omega 3 fatty acids, 1 tablespoon of ground flaxseed whisked with 3 tablespoons of water in a blender or food processor will replace one egg. Flaxseed works best in nutty, grainy items like pancakes, waffles, bran muffins and oatmeal cookies. Bananas: For its binding abilities, half of a potassium and magnesium rich mashed or pureed banana will generally replace one or two eggs in breads, muffins, cakes and pancakes. Applesauce: Full of fiber and vitamin C, unsweetened applesauce offers the binding and moisture needed in baked goods. ¼ cup equals one egg. Applesauce works best when you want the results to be moist, as in brownies. Silken Tofu: Rich in protein and fiber, but without the cholesterol and little, if any, saturated fat, this soy-based ingredient works best in dense, moist cakes and brownies. One egg can be replaced with ¼ cup of tofu whipped in a blender or food processor. Egg replacer powder: This non-perishable potato based product works universally, but is best in cookies. Adapted from The Joy of Vegan Baking; The Compassionate Cooks’ Traditional Treats and Sinful Sweets, by Colleen Patrick-Goudreau, 2007.